John Bunyan introduces a discussion of the Antichrist in his works (published in 1692). Note that “the one Man of Sin” is comprised of many antichrists. Many who take exception to the 2nd London Baptist Confession in relation to the Pope being “that man of sin” do so because they view it as an over-committed or over-specific claim of eschatology. While not arguing that this snippit is the say-all/end-all in understanding that clause, at least take it into consideration as historical data among the Particular Baptist context showing the language of the “man of sin” being used more broadly and moderately than some might think. The covenant of grace is the new covenant. Poed. But pray Sir what think you of the covenant made to Abraham and his natural seed, what kind of Covenant was it? Bap. 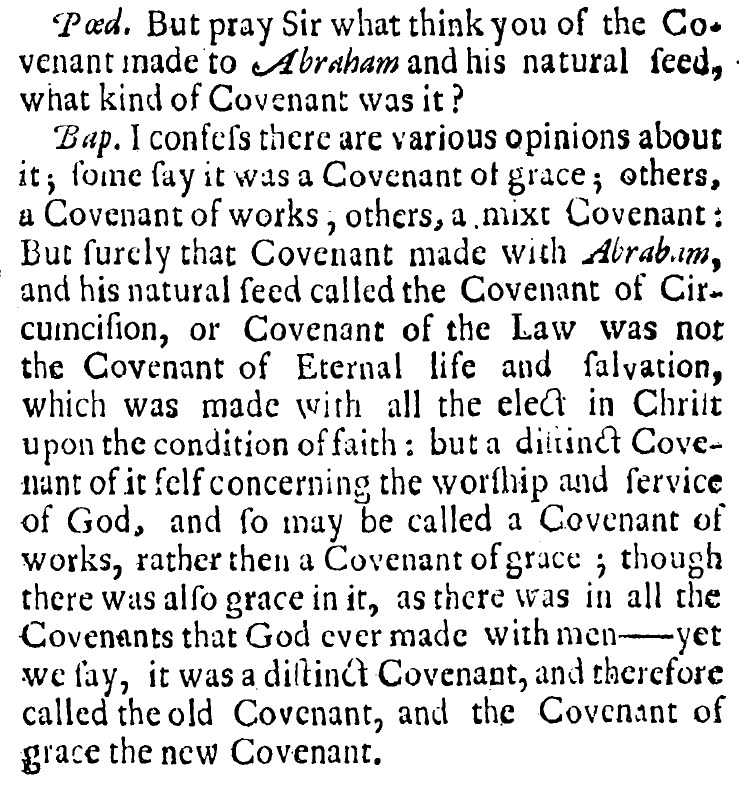 I confess there are various opinions about it; some say it was a Covenant of grace; others, a Covenant of works, others, a mixt Covenant: But surely that Covenant made with Abraham, and his natural seed called the Covenant of Circumcision, or Covenant of the Law was not the Covenant of Eternal life and salvation, which was made with all the elect in Christ upon the condition of faith: but a distinct Covenant of it self concerning the worship and service of God, and so may be called a Covenant of works, rather then a Covenant of grace; though there was also grace in it, as there was in all the Covenants that God ever made with men—yet we say, it was a distinct Covenant, and therefore called the old Covenant, and the Covenant of grace the new Covenant.